weekend getaway: breakfast of champions, originally uploaded by aarn! +25th October, 2008+. the best part of vacation is being able to spend a little more time fine tuning culinary skills, and really polishing some techniques in the kitchen. 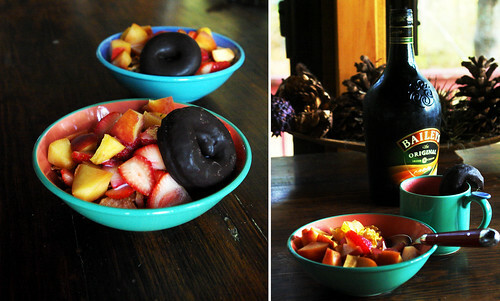 breakfast was a heaping bowl of frosted flakes with sliced out-of-season strawberries, underripe and tasteless peach, wax covered chocolate donuts, coffee and baileys. ahhh, it was so crappy and good. hahaha i just cracked up reading the description of this meal. that was darn tasty. i'm looking for that portobello and brie sandwich and drooling over everything else on the way.